In case I have not mentioned it before, Argentines have a tendency to use their own words rather than those of most other Spanish speaking countries. For example, aguacate in most países hispanohablantes is avocado. Here it is palta or palta negra. Just as strawberry is frutilla, while it’s fresa in most other countries. Well, the word for bus is the same. 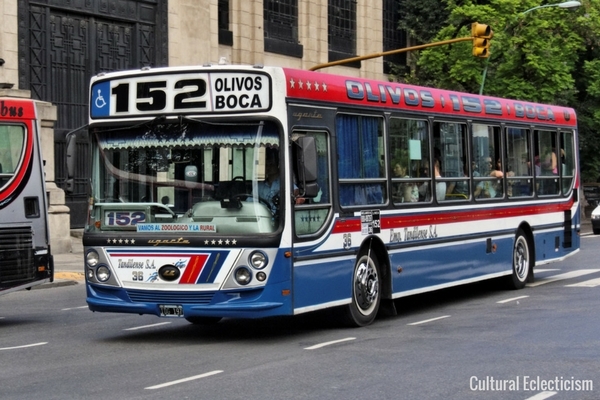 It is autobus most places, but in Argentina (as well as Uruguay ad Chile), it’s el colectivo or bondi for slang. 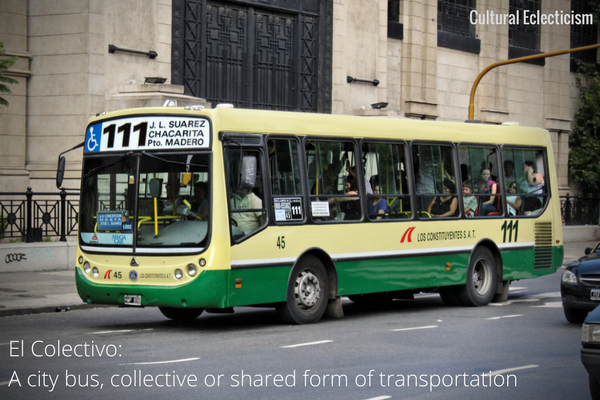 The origin for this use, rather than autos comes from he idea that buses were a type of shared or collective form of transportation. Colectivos in Argentina can be incredibly intimidating and confusing to a newcomer, but give yourself a couple of tries, get lost a few times, take the wrong bus, and you will soon become an expert passenger. I actually prefer the colectivo to the subte (subway) as you get a chance to see the city above ground. Although, admittedly both are pretty nightmarish during rush hour times. Buenos Aires has so many bus routes. We’re talking hundreds, that cover the city as well as parts of the province. What’s interesting is that the buses are not run by the city, but rather private companies and individuals. Bus quality varies drastically from air-conditioned with comfortable seats, to filthy dirty, windows opened, breaks hardly working. However, they generally look the same from the outside as each route has a distinctive color and design, which is handy for identifying your needed bus from a distance. Not all bus stops are clearly (or at all) marked. But Argentines line up very orderly single-file while waiting at the stop to ensure fairness when the bus can only squeeze more 3 people in. When you see your bus arriving, you flag it down by holding your arm up high. When you enter the bus, the driver may start to drive before you have properly paid your fare. Don’t be alarmed! You just say the street or intersection you are heading to, tap your Sube Card on the scanner, and shuffle your way towards the back of the bus. When its time to depart, make your way towards one of the two back doors and press the call button well in advance of approaching your stop. Generally drivers come to what can best be described as a rolling stop unless there is a long line of passengers waiting to board. So be ready to depart as soon as those doors swing open!